The New York Cosmos delivered a 1-0 defeat to North Carolina FC on a searing Sunday afternoon at Sahlen’s Stadium at WakeMed Soccer Park. 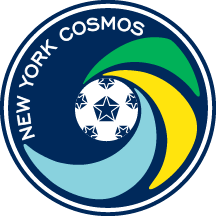 “It was a good game for people to come and watch,” said Cosmos Head Coach and Sporting Director, Giovanni Savarese. “I thought that most of the game, we had the ball. We were able to find space and created a lot of chances, so I feel that we deserved this victory. The guys were able to battle and get a very important win,” he added. The Cosmos showed their intent early on, coming close to scoring through forward, Irvin Herrera. North Carolina keeper, Brian Sylvestre, was forced off his line, and only quick thinking by defender, Christian Ibeagha, saw Herrera's header cleared from going in. The hosts were tested again in the 8th minute, when Cosmos midfielder, Javi Márquez, had a shot from outside the box saved by a diving Sylvestre. Set pieces were a key part of New York's offensive, as the team produced four corner kicks in the first 10 minutes, piling on four more throughout the half. Neither team found the back of the net before the break, though the Cosmos spent ample time in the final third. New York enjoyed possession, leaving North Carolina with no shots on target. The Cosmos showed no signs of stopping in the next 45, creating consecutive chances through Ayoze from close range and Andrés Flores from distance. Sylvestre saved both shots, but the third time was the charm for New York, as Juan Guerra nutmegged North Carolina’s keeper for his second goal in nine games. Walter Restrepo claimed the assist for Guerra's definitive goal. The goal woke up the hosts, who swiftly made their way into the Cosmos' half. Forward, Matt Fondy, had a powerful shot denied by Cosmos keeper, Brian Holt, while defender, Dejan Jaković, cleared the ball from the goal line. Holt, who made his second appearance of the 2017 NASL Spring Season, remained unshaken by the chaos in the box, keeping NCFC from finding the equalizer. The visitors added attempts, but continued to struggle against the Cosmos defense. The introduction of New York's Eugene Starikov in the 67th had an immediate impact. The forward set up a chance for Flores that went off the crossbar, before trying a right-footed shot from the center of the box off a pass from Ayoze. A stoppage time effort from Starikov after his solo run marked the end of a thrilling victory for New York. The result extends the Cosmos' unbeaten run in the NASL to seven games and adds a ninth game to the team's undefeated road record. The Cosmos will return to MCU Park on Wednesday, June 7 at 7:30 pm, as they host FC Edmonton. Tickets are on sale now. For more information, click here.